Around AD400, the Saxons came to England with a reputation for warlike ferocity and a strong reverence for the sword as a potent symbol of both strength and martial spirit. The mass of Anglo-Saxon warriors normally carried a shield and dagger (seax) and fought with spears and axes. More sophisticated members of the nobility and professional soldiers carried spears (similar to the Roman pilum) and swords. Through excavating numerous graves in England, archaeologists have learnt that the Anglo-Saxons often chose to bury their dead with a full array of weapons and armour. These grave weapons are normally of great beauty and artistry, highlighting the belief that a warrior needed to take with him into the afterlife (or in later Christianized Anglo-Saxon society — heaven), material proof of the great status afforded to its owner while alive. Ownership of both sword and spear defined the Anglo-Saxon warrior as a free man, compared with slaves (oeows) who were forbidden from carrying any arms. The great cost of acquiring a serviceable sword would also have shown the owner to be a man of means and rank. A typical Anglo-Saxon sword had a long, straight, double-edged blade with an average length of around 90cm (35.4in). In Anglo-Saxon burial grounds, the spear is by far the most common type of weapon unearthed and is regarded as the primary armament of the Anglo-Saxon warrior. All ranks of society carried the spear, from king and eon (earl), to the lowly ceonl (free man of the lowest rank) or conscripted peasant. Comprising a leaf- shaped iron spearhead and wooden shaft, traditionally made of ash, a typical spear measured around 1.5—2.5m (4.9—8.2ft) in length. ABOVE: In a detail from the Bayeux Tapestry, 1082, the English soldiers, who are all on foot, protect themselves with a shield wall while the Normans mount a cavalry attack. The spear would have been held in one hand while a shield was grasped in the other. It was extremely effective when used in a mass formation, most notably the famous Anglo-Saxon “shieldwall” or shildburh. It was this shildburh that faced William the Conqueror at the Battle of Hastings. It was only compromised when the Normans feigned a cavalry retreat, deliberately allowing themselves to be chased, whereupon they suddenly wheeled back and charged the openly exposed Anglo-Saxons. This was a fatal error by the pursuers and dictated the eventual outcome of the battle. In contemporary descriptions of the Battle of Maldon in AD991 (situated on the modern-day Essex coast in England), the Anglo-Saxon Eon Byrhtnoth is depicted as throwing two types of spear or javelin, both long and short. It is interesting that it was only when injured by a Viking spear, and finally exhausting his supplies of spears, that he eventually resorts to using his sword. ABOVE: A winged Saxon spearhead (top) with double wings to prevent an opponent’s blade traveling down the spear. A slim spearhead (bottom) to allow penetration through armor. Anglo-Saxon warriors inherited the two-handed “bearded” battle-axe from earlier generations of Danish Viking invaders who had employed it with great effect to board enemy ships. The Anglo-Saxons soon became extremely proficient at using the battle- axe. With its 1 .2m (3.9ft) haft and large honed axehead of around 30cm (11 .8in), it had the capacity to shatter shields and inflict grievous wounds. Swung from side to side, it could cut down a mounted soldier and his horse in a single blow. These long axes were wielded by the huscarls (King Harold’s personal bodyguards) and described as cleaving “both man and horse in two”. One of the drawbacks of using the two-handed axe is that while raised above the head it momentarily left the user dangerously exposed at the front to sword or lance thrusts. Despite this, the sight of a mass of axe- wielding Anglo-Saxon warriors approaching the enemy’s ranks normally had the desired psychological effect, with many contemporary accounts noting that the opposition simply fled from the battlefield. 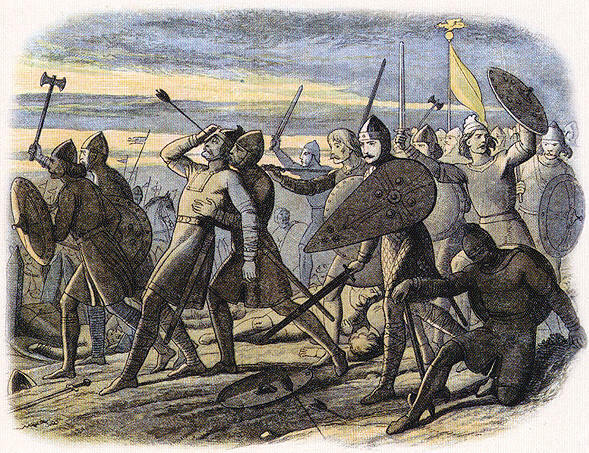 ABOVE: A later depiction of the felling of King Harold II (c.1022—1066) by a Norman arrow at the Battle of Hastings (1066). It was not only men who fought and became respected heroes during the Anglo-Saxon period. Recent archaeological discoveries have raised the possibility that women also took part in warfare. In the village of Heslerton, in North Yorkshire, England, two female burials were unearthed in 2000. Dated to around AD450—650, both women had been buried with spears and knives. Just outside Lincoln, a town in eastern England, the skeleton of another Anglo-Saxon woman warrior (c. AD500) was found with a dagger and shield. Procopius (c.AD500—565), the late Roman Byzantine scholar, notes in his history of the Gothic Wars (AD535—552) that an unnamed Anglo-Saxon princess, from the tribe of Angilori and described as “the Island Girl”, led an invasion of Jutland (western Denmark) and captured the German King Radigis of the Varni. Aethelflaed, eldest daughter of Alfred the Great of England (c. AD849—899), was known as the Lady of Mercia and was at the forefront of many battles against the invading Vikings. Aethelflaed was also responsible for the construction of a number of Anglo-Saxon fortifications. The sword is part of a magnificent hoard of royal Anglo- Saxon treasures found in a huge ship grave, in Suffolk, England, in 1939; its design is based on the earlier Roman spatha, or cavalry sword. Its decoration includes a hilt comprising a beautiful gold and cloisonné garnet pommel and gold cross guard. The iron blade is heavily corroded but the original pattern welding is still identifiable and includes eight bundles of thin iron rods hammered together to form the pattern. This would have given the sword exceptional strength, although it is more likely that it was produced solely as a sumptuous grave gift.